We had some plans for our time in San Francisco, though most of them involved seeing landmarks and trying some of the more famous local “bistros” and cafes around. The next morning we were up bright and early, even before the sun was peaking through our tent, and were packing up to spend the day in town. I think I’d gotten way too used to waking up at this time of the day. It was starting to become second nature now. As many people who have tried to get a view of the Golden Gate Bridge on a summer morning are aware, you cannot see it through the fog. We mistakenly didn’t really think this through when heading to the Presidio (the forested area on the side away from the bridge). Once we arrived, we were greeted by a pretty lousy view of a fog covered bay. 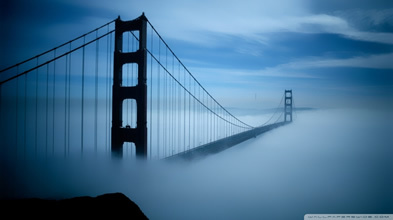 This can be beautiful in itself, as the supports were jutting out from the fog rolling over the bay that morning. Yet, we wanted to see more of the area in the sunlight once the fog had dissipated, so we decided to park and take a break near the pavilion in the Presidio for awhile. I sat and read a book on a bench while my boyfriend biked around the park area some. By about 8:30am, however, the fog had gone and we were able to capture some great pictures and see the amazing view of the bay. This really is a great area to visit and it’s awesome San Francisco has preserved the Presidio and kept it from being developed. It’s a beautiful location for a park and adds a ton to the city’s charms. There’s a lot to do in San Francisco, whether you want to see the “Full House” house, or want to take a trolley up the winding streets to find a quaint cafe to sit and stare into the bay. You could spend days just enjoying the many parts of the city and what it has to offer. We stopped at a cafe in the historic district after hanging out at the Presidio for awhile, and had some “specialty” coffees, which ran upwards of $7 each!. Well worth it however, even after our money was getting stretched by the trip we were on. Afterwards we took a trolley up to the museum to see an exhibit I had heard about being in town, Monet. It was excellent, had a lot of paintings I hadn’t seen before even when I was in France as this was the travelling collection of his in the New York Museum of Art. We didn’t have a ton of plans after this, so we decided to hang out in some of the local areas throughout the day. There is a whole lot of different places, shops, boutiques in San Fran to explore, and we decided to spend the afternoon there. Tomorrow we were going to head off to Yosemite and see the national park, likely camping there for the night. We spent the rest of the afternoon on our first day in Portland with quite a leisurely pace enjoying what the city had to offer. This was a small city, relative to attractions, so most things involved parks and seeing the amazing views in the Pacific Northwest. The forest cover was indeed exceptional around the area, and Oregon is a truly beautiful place. The next day we decided to go to our next destination, which was San Francisco, prior to our move into the Western desert states, like Utah and Nevada. We didn’t want to go all the way to South California as that was out of the way of many other locales. The next morning, after a long night of sleep mind you, was excellent. A beautiful sunrise broke through the window of our tent as we had made camp the night before at about 10pm. I love the early mornings when you’re camping out, there’s really nothing like it. It’s not only beautiful, but quiet as well. It’s a very different feeling waking up and knowing that you can take as long as you want and leisurely begin your day. We had a plan today to go into Portland and checkout some of the many “hipster” hangout spots, such as the cafes and stores. There was much to see still in the city. We stopped at a cafe in town, that was quite nice. Lots of “exotic” styles of coffee, with “lava salt” or strange finishings to the cup. I had a well flourished cafe latte, which was incredible. We struck up a conversation with a guy who was from the area and asked him how he liked living in Portland. As with the rest of the people we had met up to this point, he spoke nothing but praise about the area and the culture of the city. Definitely a great place to live! We stopped at this strange local shop after the cafe that had a lot of fetuses in jars from different animals, and strange stuff on the walls (like wild boar heads). Certainly a unique place! At around 2pm we headed out from Portland bound for San Francisco. This is a pretty long trip, for those thinking about doing it yourself. We knew we’d arrive by about midnight, so I called and arranged a campsite on the outskirts of the city in advance so we could just show up and camp and then start the exploring the next day. This was a long trip, it took us about 10 and a half hours to arrive. We always tried to make the best of the trips from one location to another, stopping at local shops and diners along the way. This trip was no different. On the way south we encountered a lot of small towns with their own unique things going on. Whether those were American folklore, tourist traps or just beautiful views, this was one of the best parts of the trip to this point. Northern California is beautiful. We stopped at a diner about 5 hours in for dinner and traded off driving duties. I picked up the wheel and continued the rest of the evening. In the next post, some of the things we saw and did on the journey will be talked about along with our first day in San Francisco.